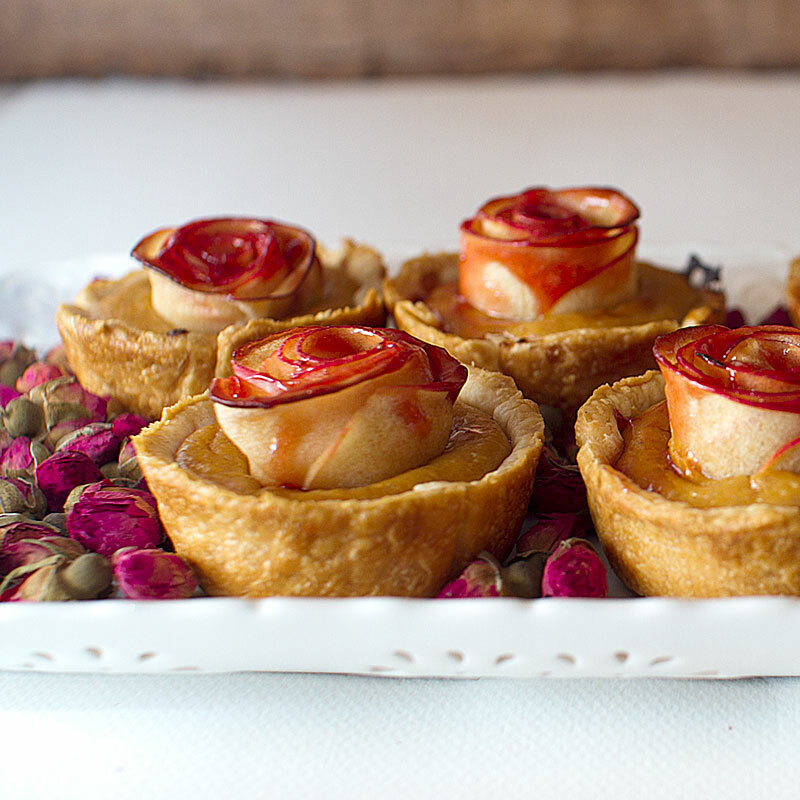 THEEEE most popular recipe here on FMITK is, without a doubt, the mini rose apple pies. I absolutely love them – they’re deceptively easy and impressive, especially if you use store-bought pie dough. If you’ve been around FMITK before, you know that I tend to make everything from scratch. If I could milk the cow to make the butter to make the pie dough, I would. Even a make-it-from-scratcher like me uses store-bought pie dough. It’s the holidays and we’re busy. So there. 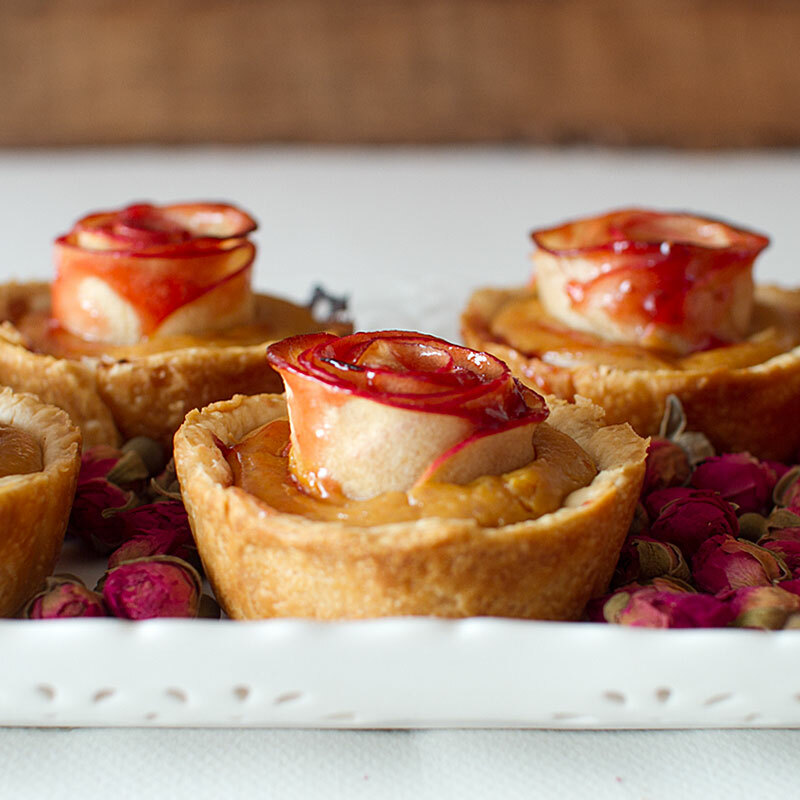 These little apple pumpkin pies are the Thanksgiving remix – half pumpkin pie, half apple rose. ALL DELICIOUS. If pumpkin isn’t your thing, try the original, all-apple version of this recipe. 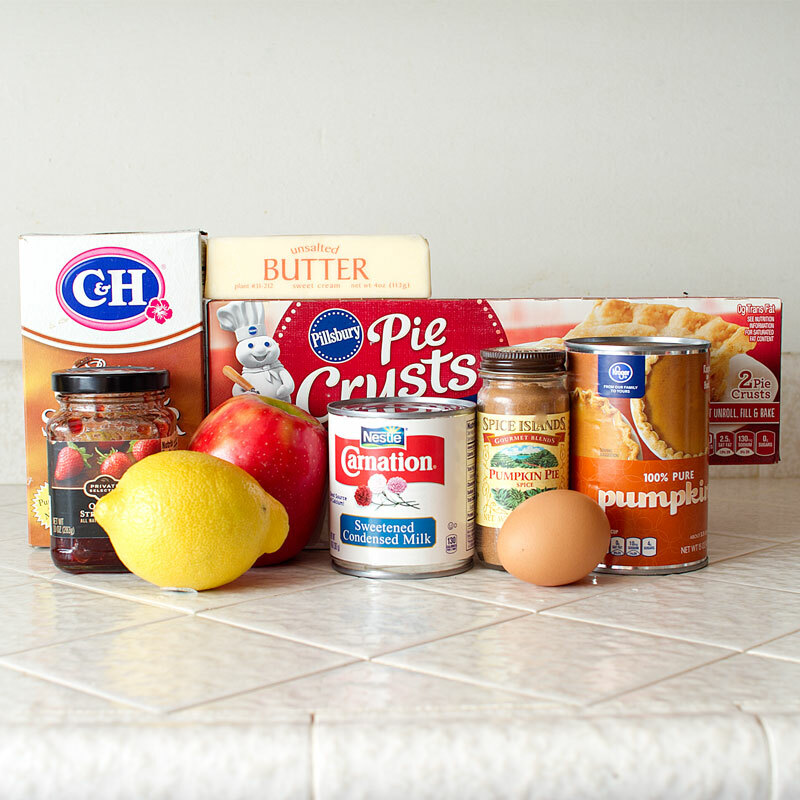 You’ll need brown sugar, pie dough (home made or store-bought) butter, pumpkin puree, egg, pumpkin pie spice, condensed milk, apples, lemon and strawberry preserves. 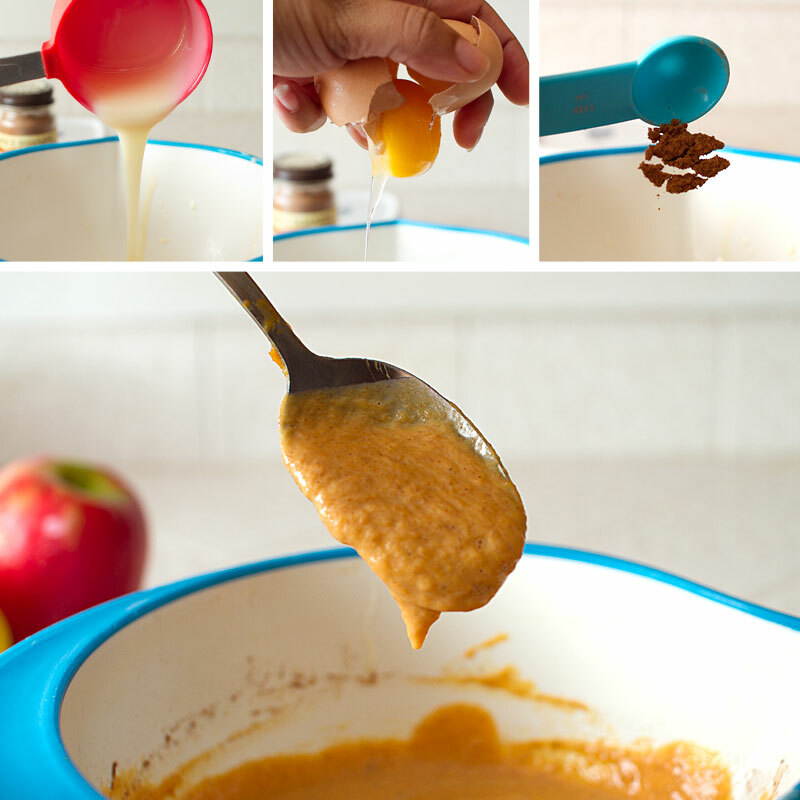 In a medium bowl, combine pumpkin puree, condensed milk, egg, pumpkin pie spice and salt. 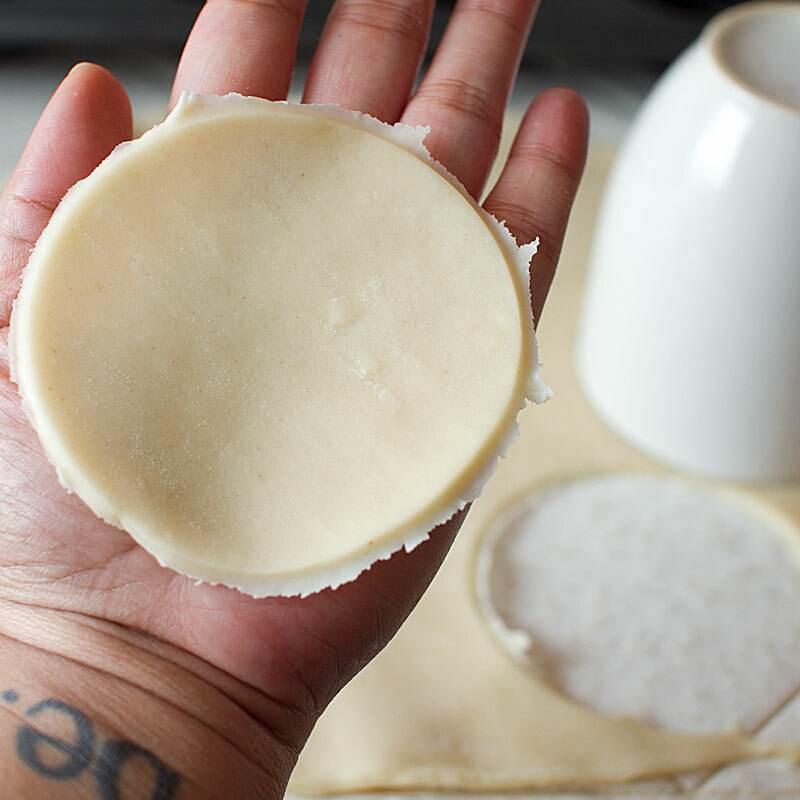 Cut pie dough into 3 1/2″ rounds. 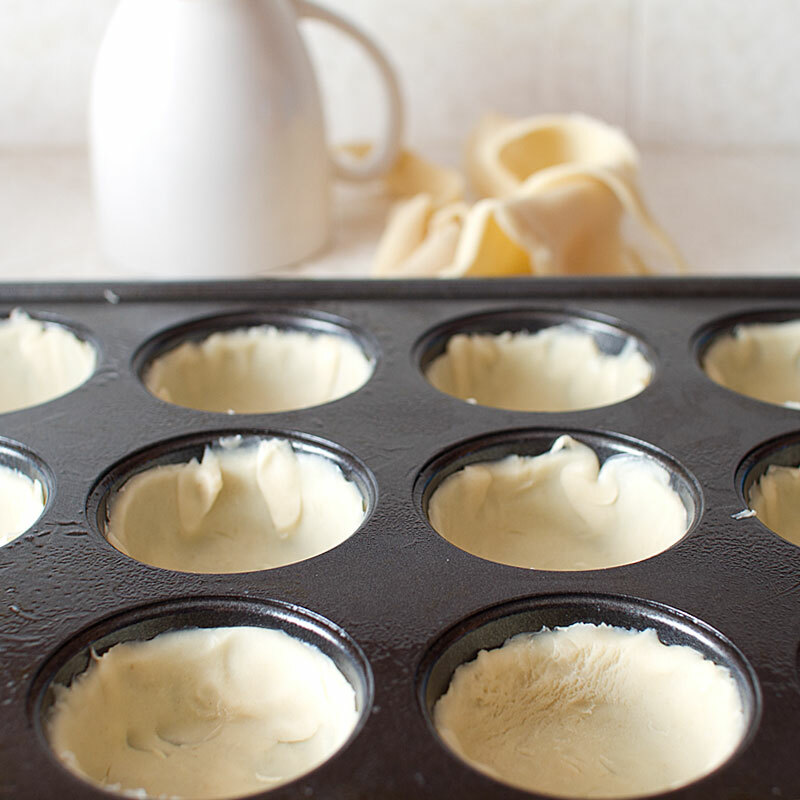 Fit the pie dough rounds into a greased 12-cup muffin tin. Fill each cup half way with the pumpkin mixture, about 2 tablespoons per cup. Bake at 400F for 15 minutes. 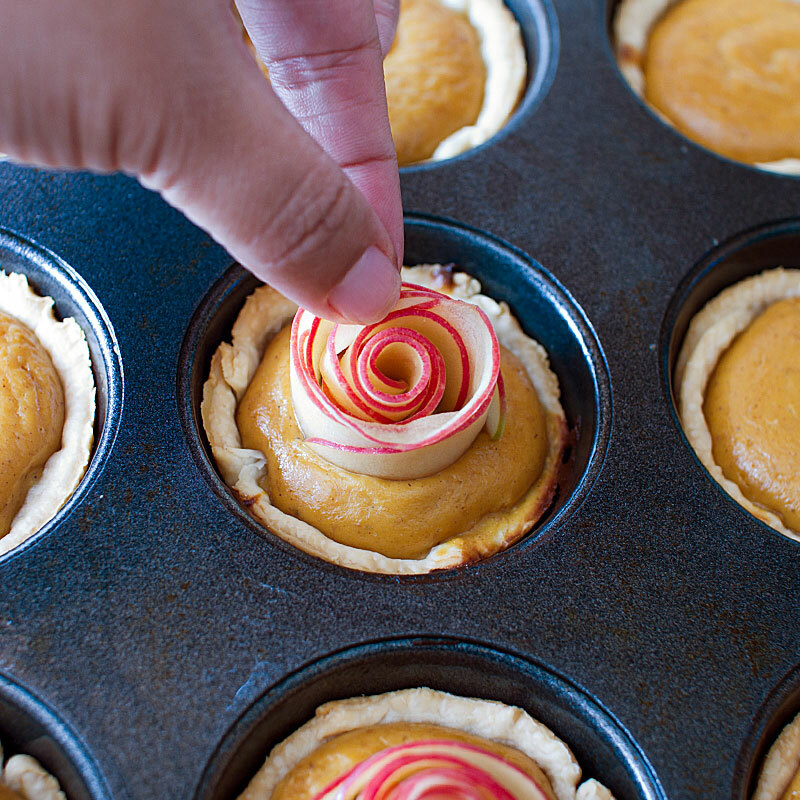 While the pumpkin is baking, prepare the apple roses. Cut around the core of the apple. I used a mandolin to cut the slices thinly. It’s a breeeeeze! 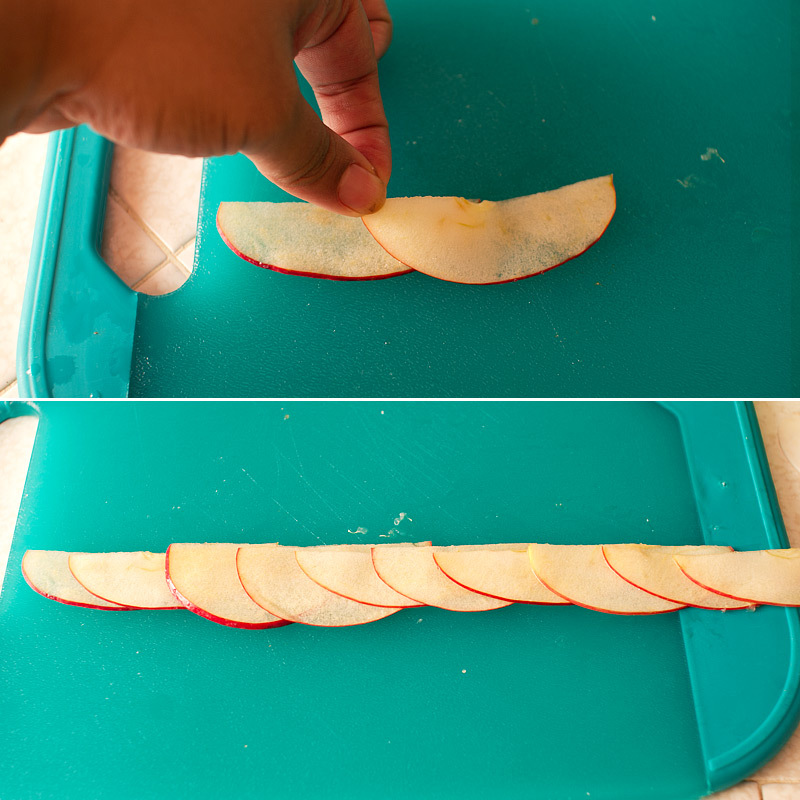 You could also cut the apples with a very sharp knife into very thin half-moons. Thin, uniform slices. Thanks, mandolin! And I still have all my fingers! Yuuhhhsssss. 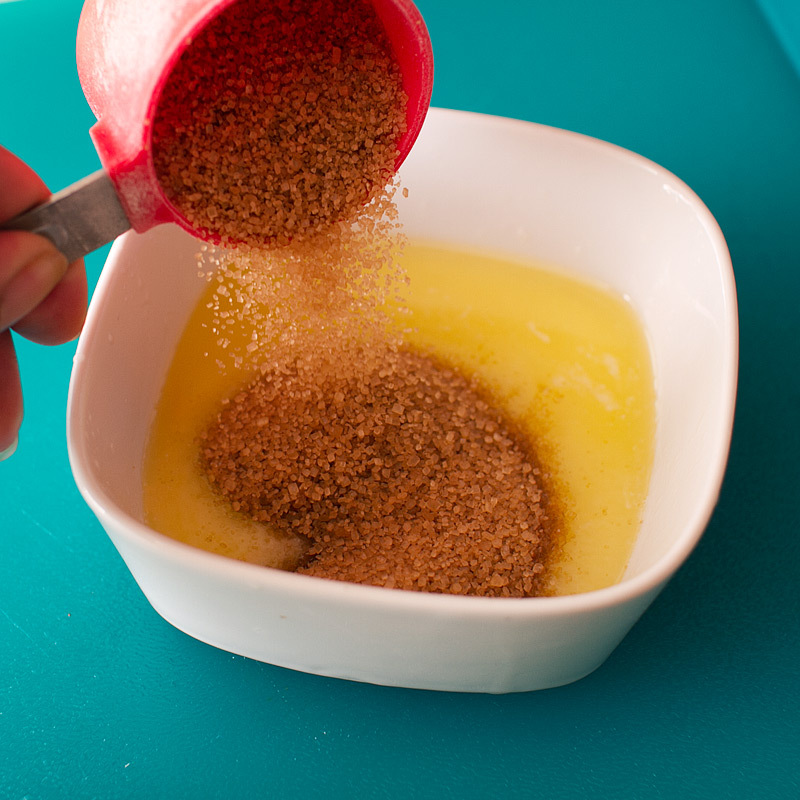 Melt 2 tbsp of butter and combine with 1/4 cup of brown sugar. 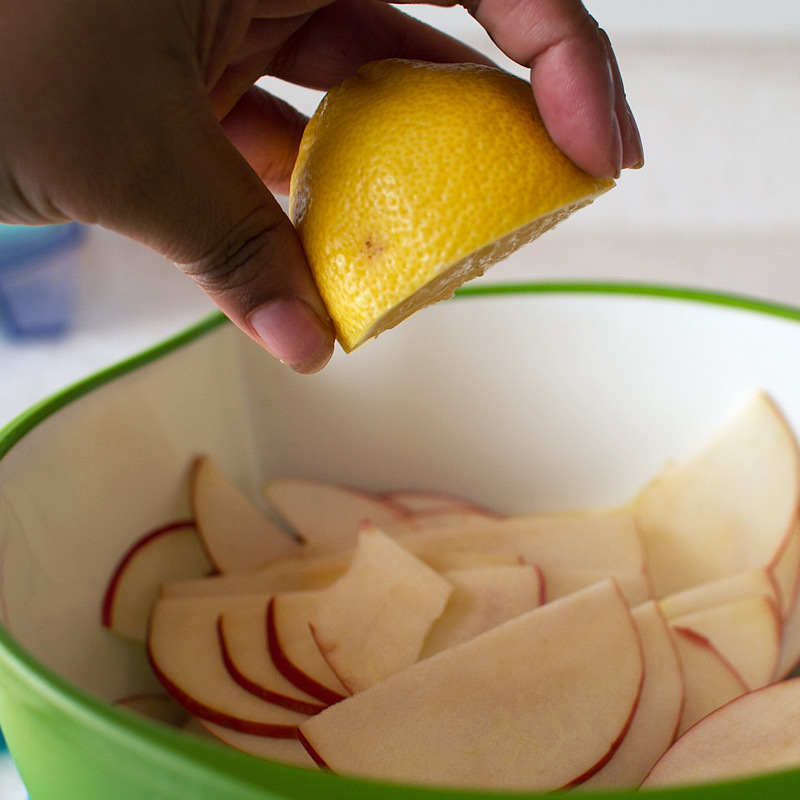 Add the lemon juice to the sliced apples and toss. Pour the butter + sugar mixture over the apples and toss to combine. 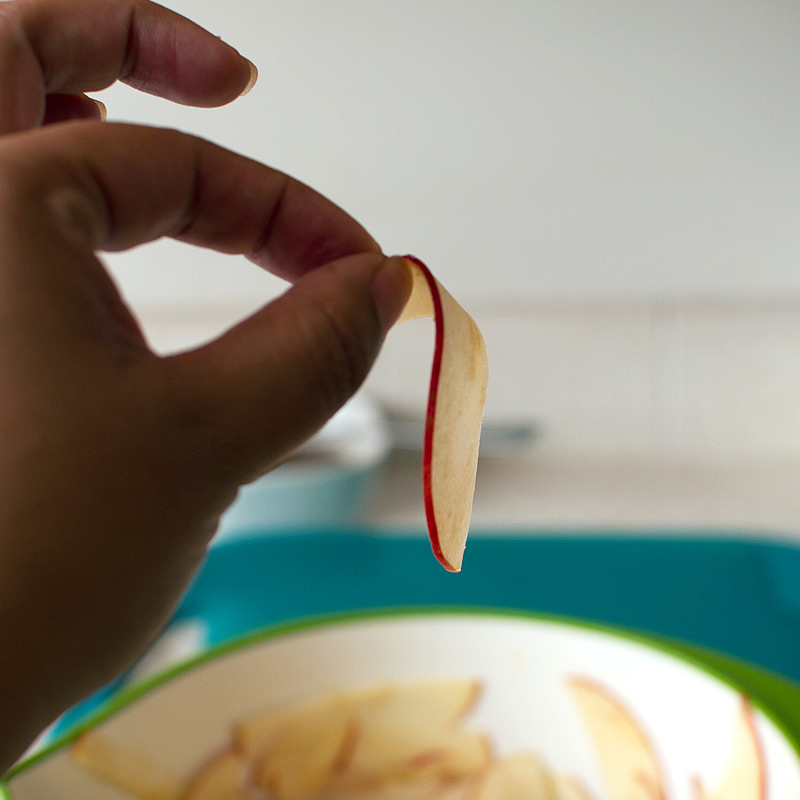 Microwave the apples for 1 minute, until pliable enough to roll. 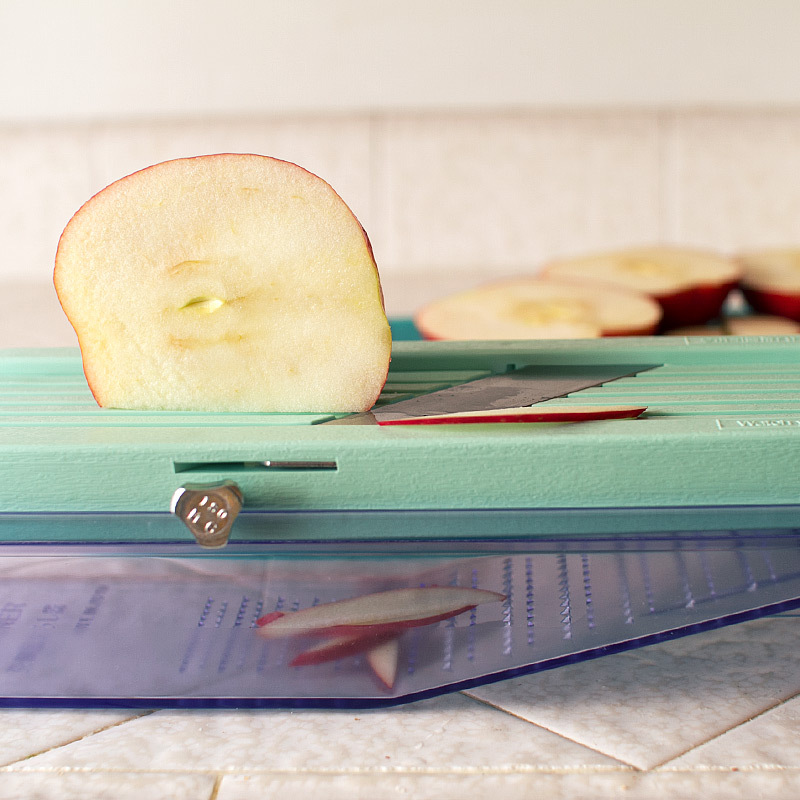 Start with about 8-10 slices, laying the slices out horizontally, overlapping the previous apple by half. Being rolling tightly on one end toward the other, using one hand to roll and the other to support. Add additional “petals” to the outside until desired size. 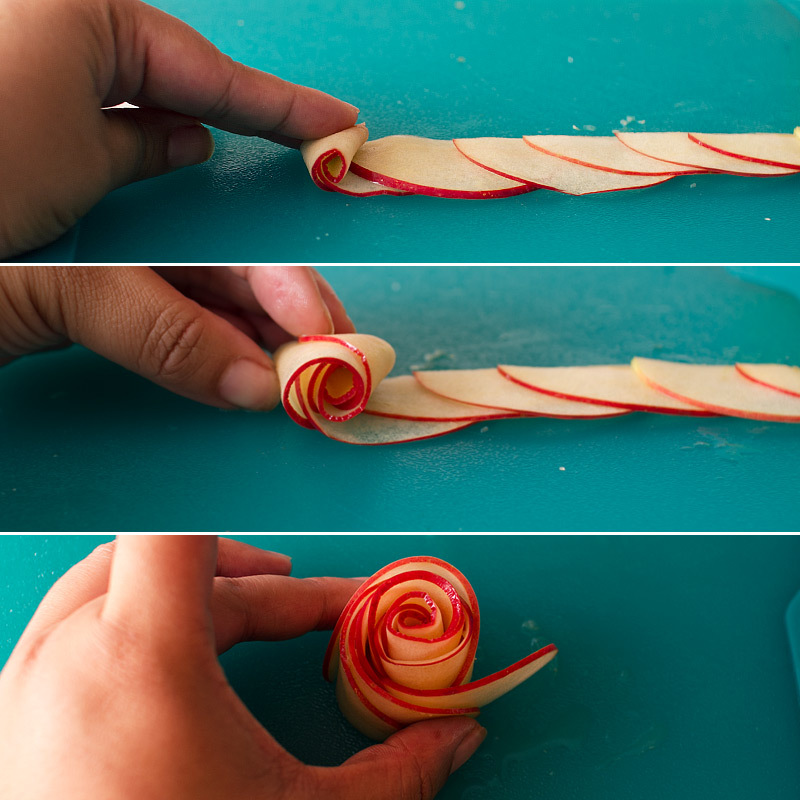 I used about 10-15 apple slices per rose. While rolling the roses, keep them nestled together in a bowl. They may unravel a tiny but, but it’s easy to tighten them back up. 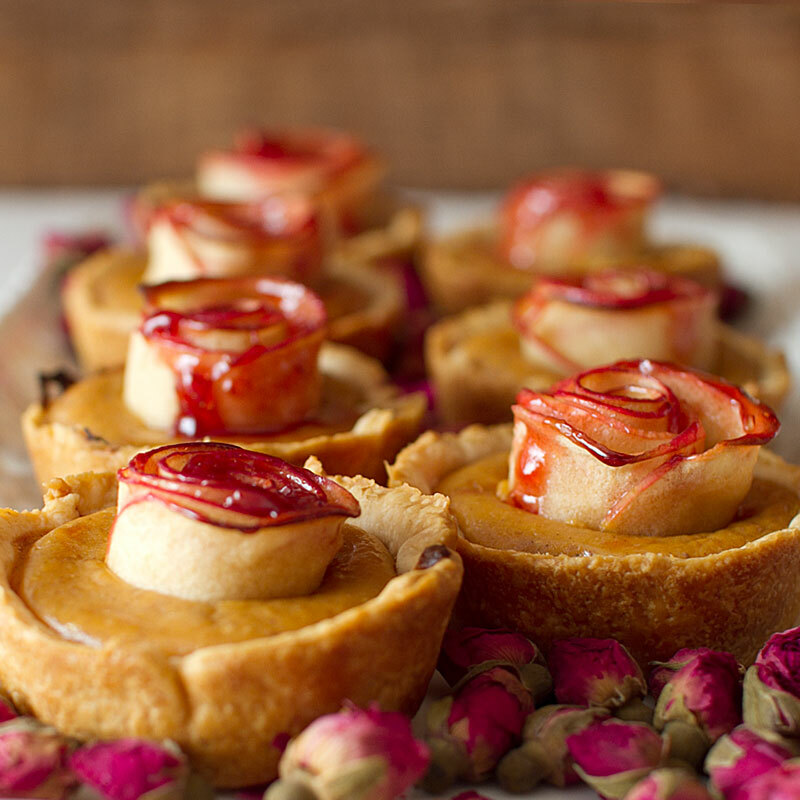 After baking for 15 minutes, remove the pumpkin pies from the oven and top each with an apple rose. If you like, gently pull on the “petals” to spread them out and make the rose bigger. Reduce the heat to 375F and bake an additional 15 minutes. Once you remove the pies from the oven, gently brush on the warmed strawberry preserves – just enough to add some shine and a bit of red color. I decorated the plate with dried rosebud tea that I found at the Persian market. 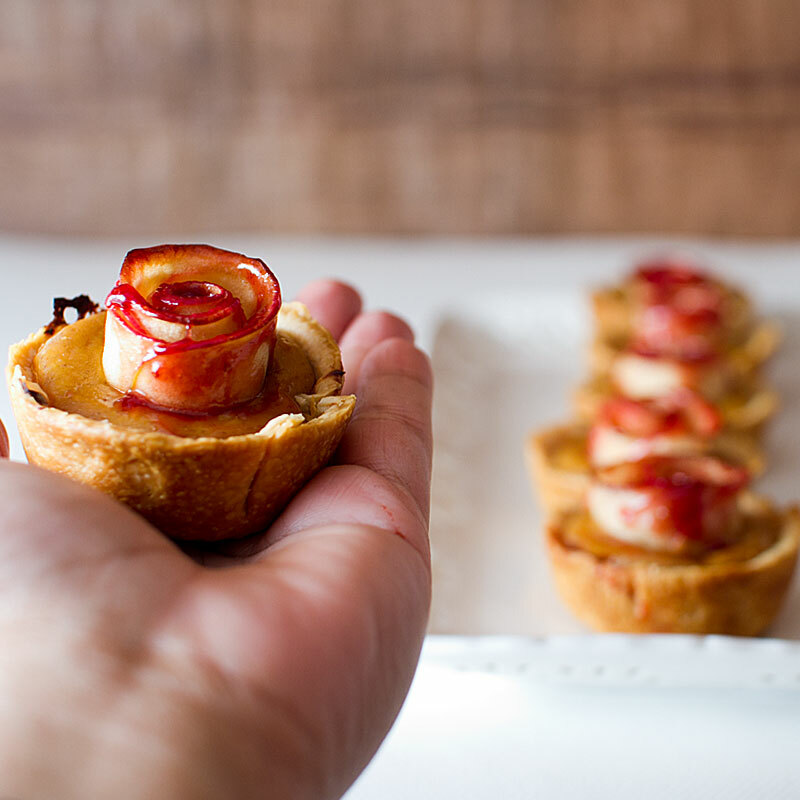 An updated holiday version of my favorite mini rose apple pies. Combine pumpkin puree, pumpkin pie spice, eggs, salt and condensed milk. Stir to combine. 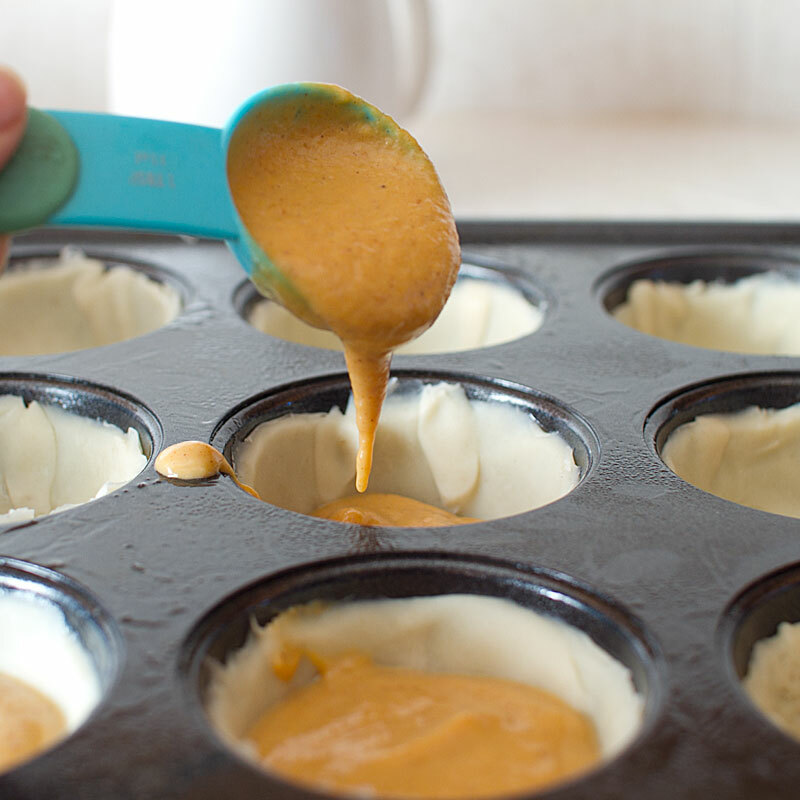 Preheat the oven to 400F and grease or butter a 12-cup muffin tin. 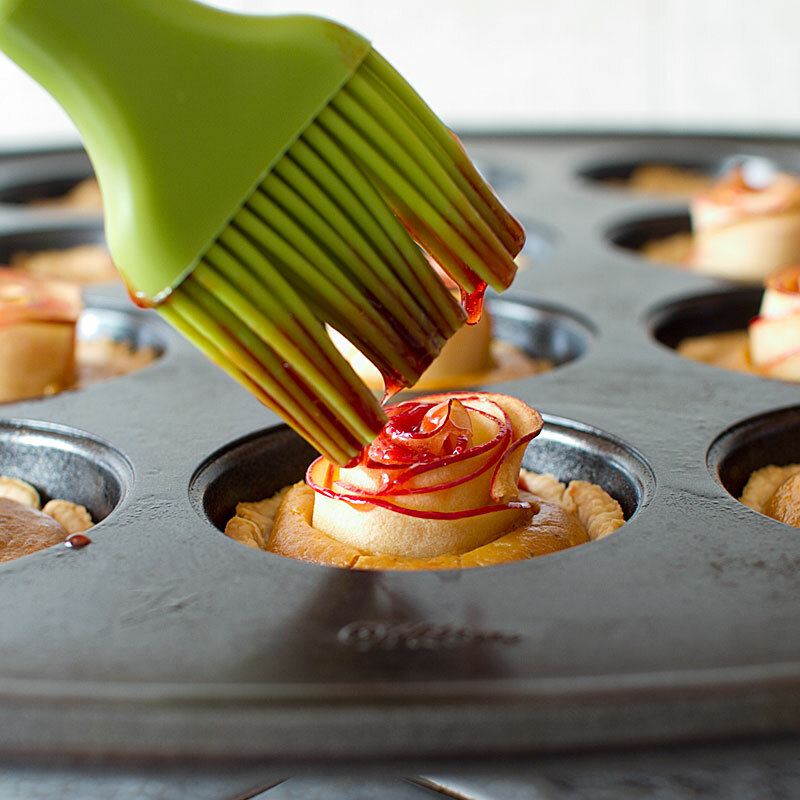 Using a 3 1/2" cookie cutter, cut circles from the pie dough and fit a circle into each cup. Fill each cup half way with the pumpkin filling. Bake for 15 minutes. 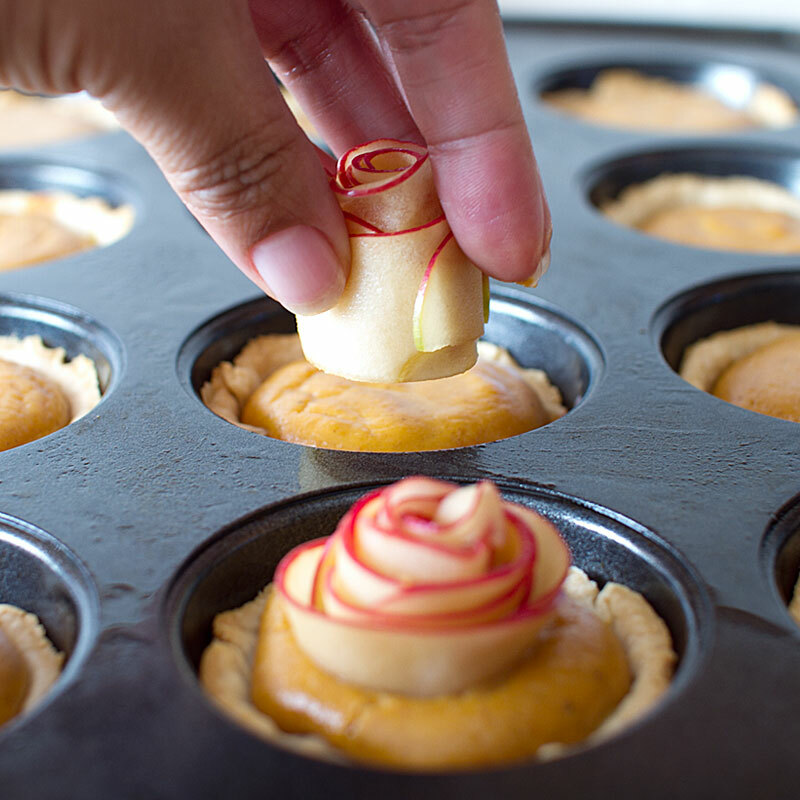 While baking, prepare the apple roses. 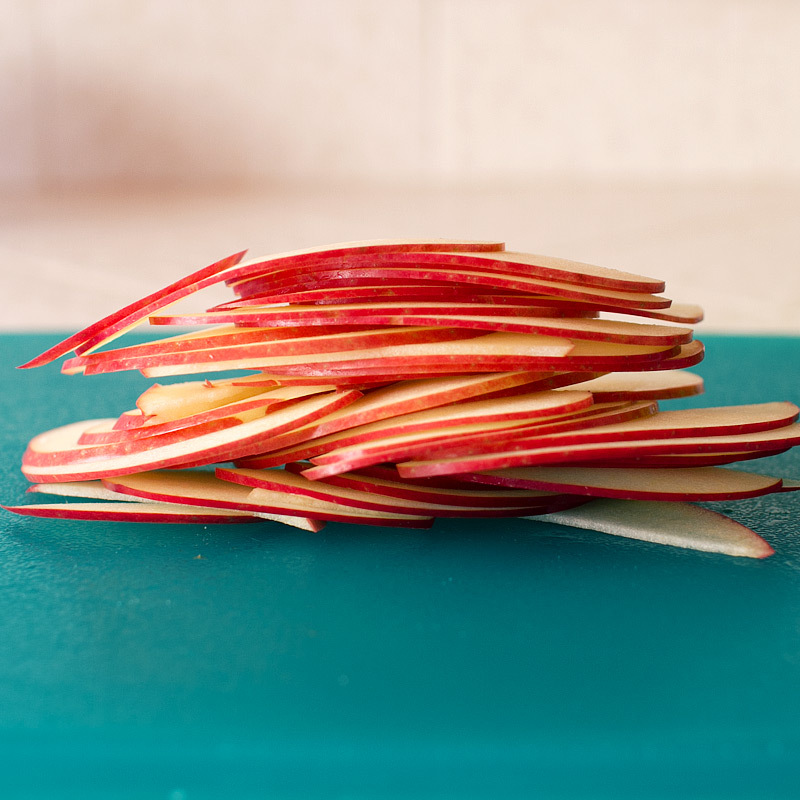 To cut the apples and remove the core, place the apple stem-side up and make a cut about 1/8" from the center of the apple - basically making straight cuts around the core. Repeat on the remaining sides, you should have 2 large pieces, 2 small pieces and the core. 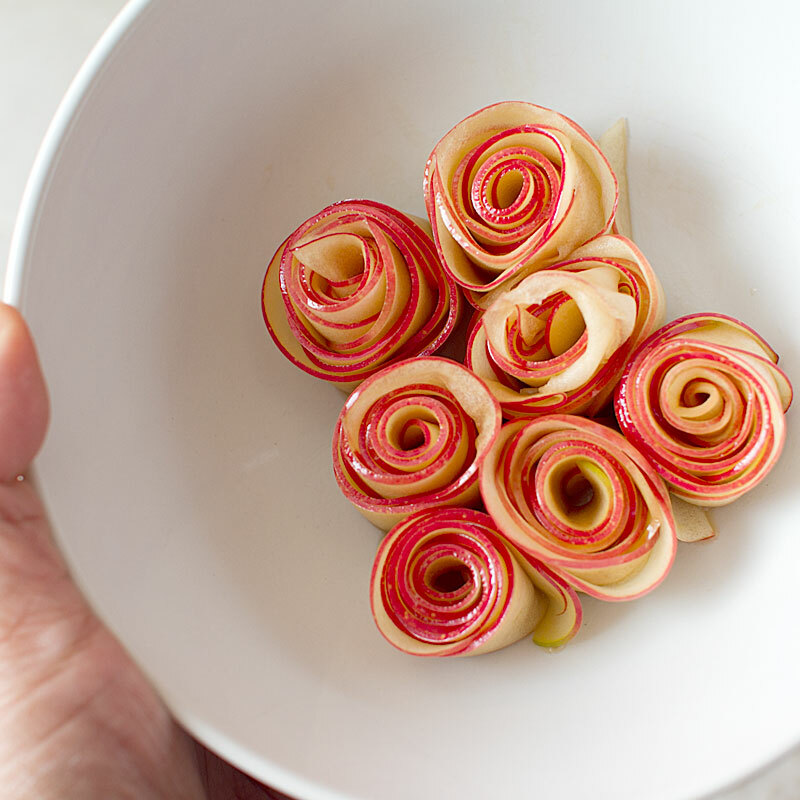 To form the roses, place about 10 slices of apples on a flat surface, laying them out horizontally and consistently with the skin side facing you. Place each slice so it overlaps the previous slice by half. 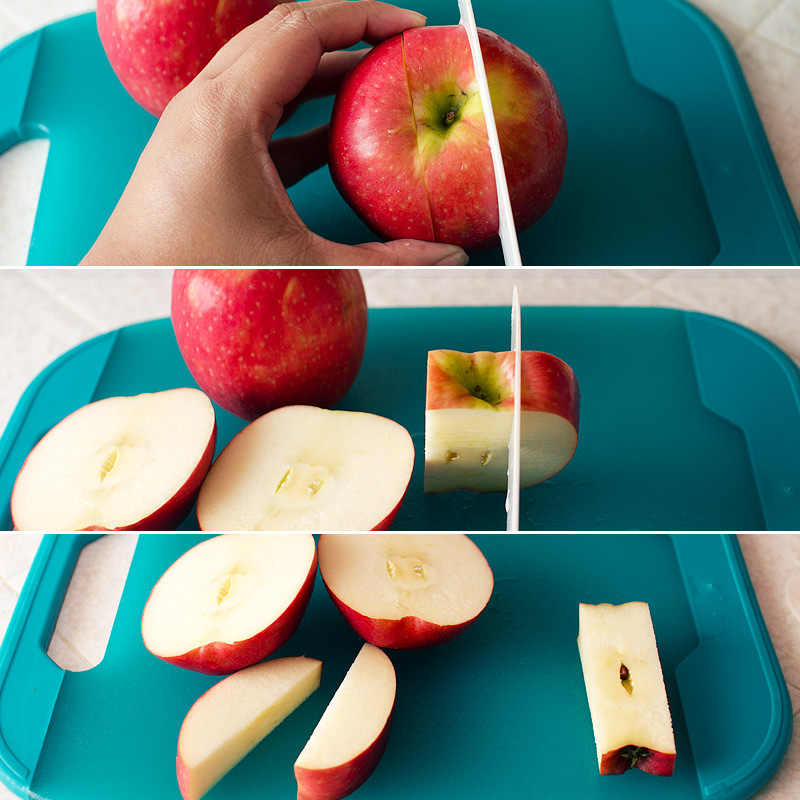 Begin tightly jellyrolling the apples from one end to the other. 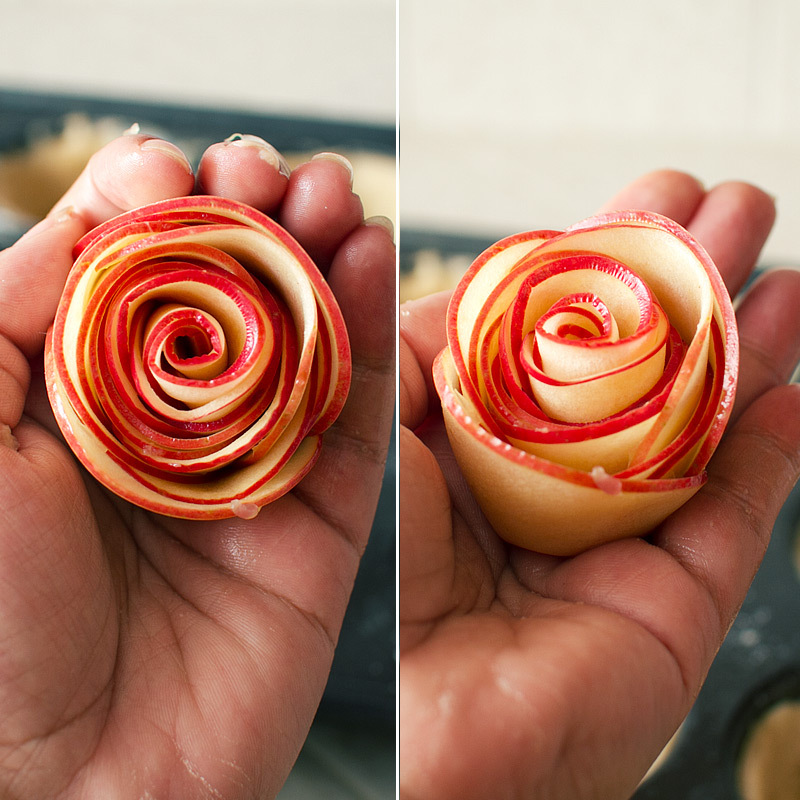 Once you've got the basic rose shape, pick up the apples and add any additional apple "petals" around the outside, depending on how large you want the rose to be. I used about 10-15 slices per rose. Nestle together the roses in a bowl for keeping. Place one rose on top of each pumpkin pie. Lower the temperature to 375F and bake for an additional 15 minutes until pumpkin filling is set and apples are cooked through. Warm the strawberry preserves in the microwave for about 30 seconds, until melted. 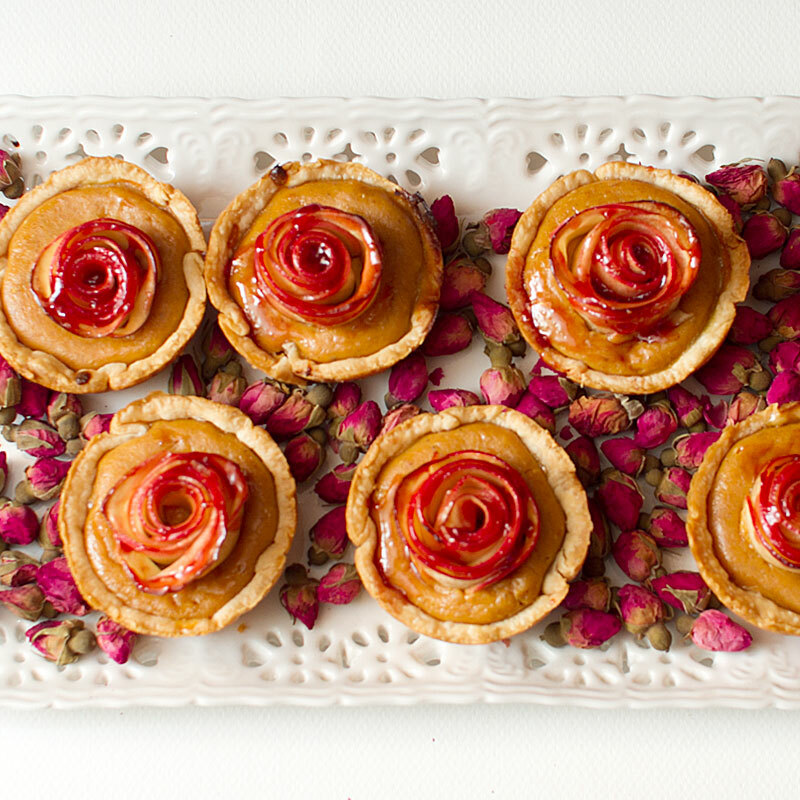 Brush preserves over each apple rose to glaze. I can eat about 10 of those easy. Looks yummy! Thank you for posting this beautiful work of art. Really so beautiful and creative! As long as your cupcakes and apples have similar baking times (~20ish minutes), I can’t see a problem with surrounding the baked apples with cream cheese frosting. That sounds amazing!